These days, being a member of the so-called "jet set" is nothing to brag about. If you are on a plane too often, I feel sorry for you. And traveling on your own Gulfstream V is very uncool right now. If the bank hasn't taken it back already. 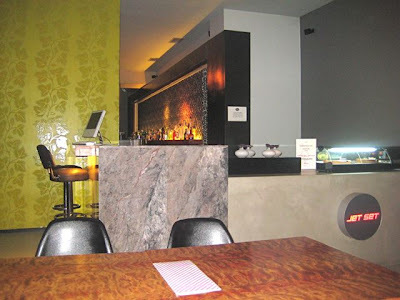 It's true, you might find me once in a while sitting along side a jet setter at fashionable spot like Buddha-Bar. But usually, I just want some basic comfort food like a burger. 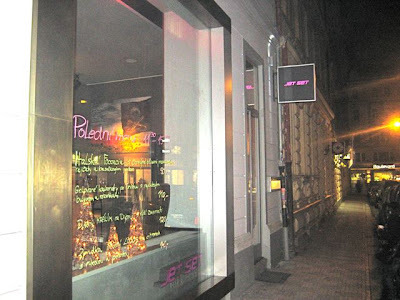 Which is why a friend told me to try the restaurant, Jet Set. She said they had a good hamburger and, despite the name, is not too expensive. Since I have a hamburger obsession, I felt compelled to make the short-haul trip over from Vršovice. There are actually two Jet Sets. There is one in Prague's Anděl neighborhood. We were at the location near Wenceslas Square. 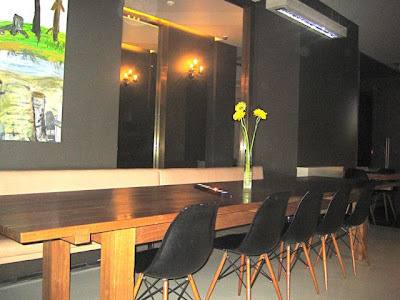 When we came into the bar area, there was no one there, and the place felt deserted. The interior was modern and sparse. It felt cold and empty. There was amateur art on the walls. 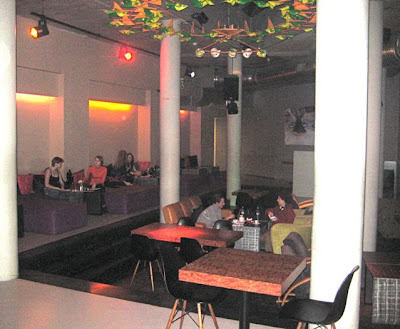 In the back, there was a club-like space with high ceilings and seating that you could stretch out on like a bed. The waitress brought us some slices of French bread. 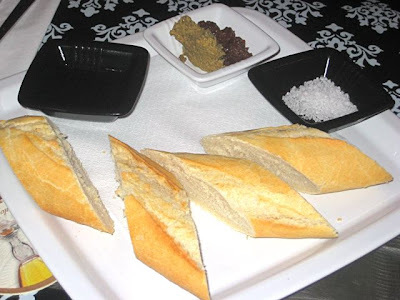 On the side, there was a good olive oil, chopped green and black olive, and salt. It was different from the usual bread basket, at least. 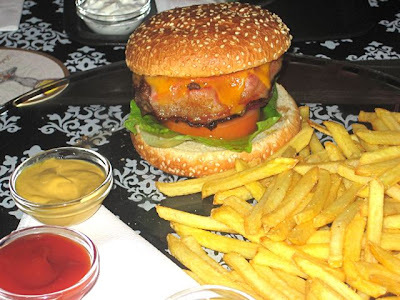 I ordered the bacon cheeseburger with fries (180 CZK). At first glance, it looked pretty good. Then, I opened the lid and checked out the works. Not so good. The bacon was, let's say, unamerican -- very ham-like. The bun, lettuce, tomato, and red onion were fine. But when I took a bite, I was not happy. I wasn't asked how I wanted it cooked, but it was well done, to the point of being dry. 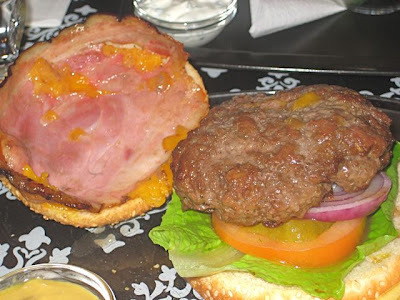 The patty was dense and rubbery, and I actually got tired chewing. I lost the will to finish it. 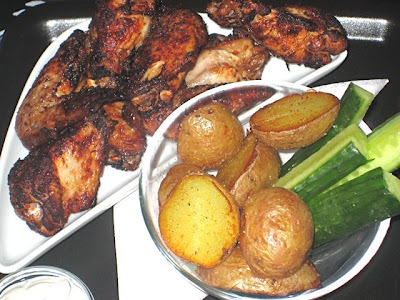 V got the honey marinated chicken wings with "American potato skins" (170 CZK). The wings were pretty good. However, we really missed having some kind of barbecue or wing sauce to go with them. The marinade didn't really stand out too strongly, and they were fairly boring on their own. The potatoes weren't really American-style skins, but new potatoes with the skins on. They were fine. To drink, I had a half-liter of Stella Artois (50 CZK). V had a bottle of sparkling Bonaqua water (45 CZK). This water really annoys me. It's bad enough that it is expensive, filtered tap water. But on top of that, it is served in a miniscule .25 liter bottle. It really bugs me when restaurants serve this stuff instead of .33 liter bottles of Mattoni. 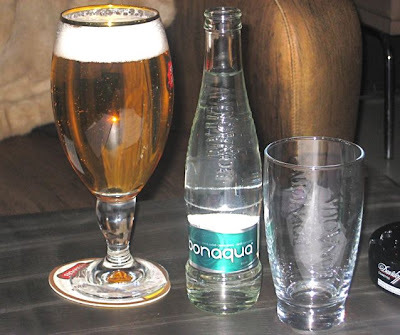 I urge others to make this demand in restaurants that have only Bonaqua: Czech water, please! I returned for another visit by myself. 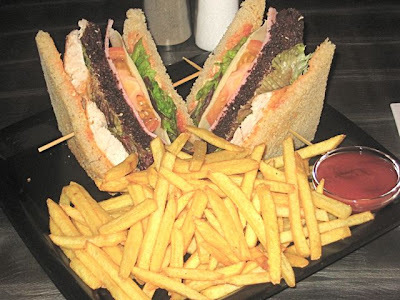 I tried their Jet Set Club Sandwich with fries (120 CZK). The price was OK, and it was a reasonable amount of food. But again, I was unsatisfied. My big disappointment? They used ham instead of bacon. All the ingredients were freshly prepared. The center bread slice was dark bread. It just didn't have the classic flavor I was looking for. 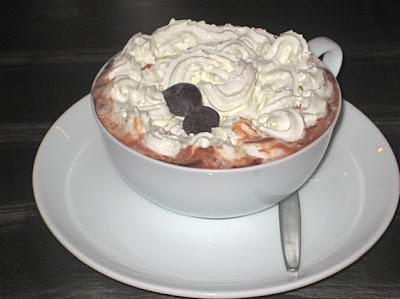 I was in a chocolate mood so I ordered a hot chocolate (55 CZK). It was pretty standard stuff -- not strong enough chocolate flavor for me, though. The whipped cream and some chocolate chips that melted helped make it better. 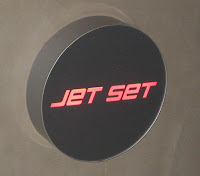 But everything at Jet Set would need to be better before I'd want to go back. Dare I say that the food on this American-style menu should taste more American? Our meals weren't fast, comfortable, or spectacular in any way. In short, a crashing bore. Just felt like saying I agree with the mattoni comment. Bon aqua is nasty stuff! I also agree with your point about the water. It particularly irritates me in otherwise excellent places such as Masala and Modry Zub. They serve food hot enough to scorch your tastebuds but insist on serving water in thimble sized bottles. I wouldn't even mind paying more for a larger size. It would at least save me from having to flag the waitress down twice!